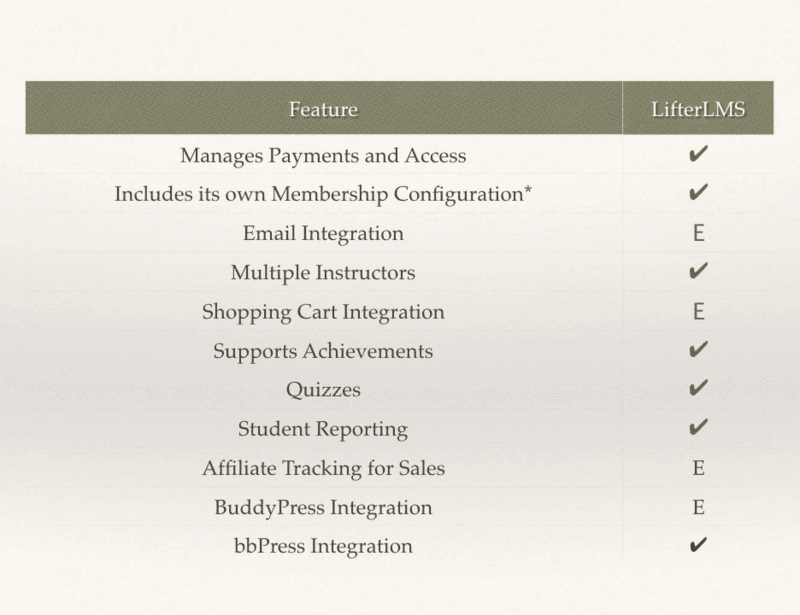 LifterLMS is a Freemium Learning Management System plugin for WordPress. You only pay for additional modules like the Stripe payment gateway, MailChimp integration, or for the Pro package which includes support and an additional graphics package. By including almost all features and functionalities as part of the plugin instead of requiring on integrations with other plugins, LifterLMS makes installing and creating courses the easiest to get started. LifterLMS also has a premium theme available, LaunchPad, designed to provide an optimal learning experience with the plugin. Note that the plugin works fine with other WordPress themes, also. LifterLMS is also the only company, to my knowledge, who offers services where they will configure the plugin for you. The main plugin is Free which includes access to the full plugin and payments via PayPal. LifterLMS Pro – $99/year includes support and a graphics package. Stripe -$99/year for 1 site or $299/year for up to 5 sites. MailChimp or ConvertKit integrations – $99/year for 1 site or $299/year for up to 5 sites. Many of the Learning Management plugins require extensions for almost all aspects outside of actually delivering the course. These may include extensions for membership integration or gamification. LifterLMS includes many features as part of the core plugin. It does include extensions for integration with BuddyPress and WooCommerce by default. Premium extensions are available to integrate with MailChimp and ConvertKit and for using Stripe as a payment gateway. E – It is accomplished using an extension or additional plugin. D – It is dependent on an integration, such as a shopping cart. From the Dashboard menu select Courses > Add Course. In the Create a Course Dialog Box, enter the name of your course and select the Create Course button. Once you create a course, you land on the course options page where you have many options available including limiting the class size, setting start and end dates, requiring a prerequisite course to be completed first, and pricing. Here you will configure your course description and have the capability to create different descriptions for those already logged into the system versus those reading the page who are not logged in. Description – Enter the course description that visitors will see. You have the ability to show different descriptions to visitors who are logged in versus those who are not. General – Under the General setting, you set the estimated time for course completion, the difficulty level, if desired, and you can set links to a course video or audio file. Restrictions – You may enable and set the requirement for a prerequisite course, limit the number of students who can enroll in the course, and set start and end dates if your course has a specific timeframe for availability. Price Single – Configure single payment options, here. Enter a sku for the course and the price. You have the option to display custom text, for example “Free” on the purchase page instead of a number. If you want to offer a sale price, you may set that here along with the start and end dates for the sale. Recurring Payment – If you are collecting payment as an ongoing fee or allowing users to pay in multiple payments, set those options here. Students – you may manually add and remove students from your course. Reviews – LifterLMS provides the option to display course reviews from your students. If the course will be limited to those in a specific membership, you will also set that on this page. 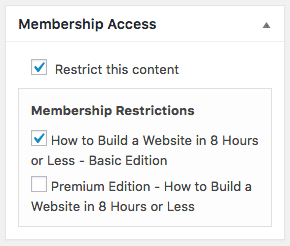 When a membership option is configured, a dialog box to assign access will appear in the right sidebar. 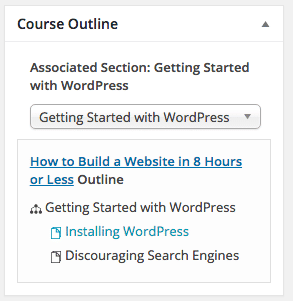 When you create a course, a basic course outline is created and displayed on the course page. You may also start filling in that course outline, and begin creating sections and lessons from this outline. In LifterLMS courses are divided into sections that consist of a series of lessons. To create a section, from the Course page under Course Outline select Add > Add New Section. This opens the Create Section dialog box. Enter the title for your section and select the Create Section button. You can drag and drop sections in the course outline to rearrange their order. You may add a lesson from the Course Outline on the Course Options Page, or from selecting Courses > Lessons > Add Lesson from the Dashboard menu. Enter the content for your lesson the same way you would add content in a blog post or page. Configure your settings for the lesson. These include linking a quiz to the lesson, if desired. You can require them to pass the quiz in order to move on. Restrictions such as Drip Content and prerequisites. And for general settings you can add a Video or Audio URL. (Note that you may embed video and audio directly into the lesson the way you would a blog post. It’s not required to place it here.) You also have the ability to make a single lesson free in order to give people a sample before purchasing. If the lesson is set to free, people will not have to be registered on the site or signed up for the course to see it. Once in a lesson, to create another click the Add Lesson button at the top of the page. Enter your desired lesson information as described above. In the right sidebar, select the section for that lesson. This will associate it with the proper section within the Course Outline. When taking a course in LifterLMS, the My Courses page displays a listing of your courses in progress and a progress bar for each course. From here you can view the course and complete more lessons. Any certificates, achievements, or memberships that you have are also displayed on this page. LifterLMS provides many powerful features to help you create your own online courses. As a freemium plugin, it allows you to get started immediately without requiring payment unless you decide you want a premium extension. For more information on Learning Management Systems and Courseware for WordPress, see the Main Courseware page and other Learning Management pages on this site. Author’s Note: This article is part of a series of articles covering a variety of WordPress Learning Management System plugins and 3rd Party hosted LMS platforms.